Luxembourg , officially the Grand Duchy of Luxembourg (Luxembourgish: , French: , German: ), is a landlocked country in Western Europe. It is bordered by Belgium to the west and north, Germany to the east, and France to the south. It comprises two principal regions: the Oesling in the north as part of the Ardennes massif, and the Gutland ("good country") in the south. Luxembourg had a population of 524,853 in October 2012 and has an area of 2,586 square kilometres (998 sq mi), making it one of the smallest sovereign nations in Europe. As a representative democracy with a constitutional monarch, it is headed by a grand duke, Henri, Grand Duke of Luxembourg, and is the worlds only remaining grand duchy. Luxembourg is a developed country, with an advanced economy and the worlds second highest GDP (PPP) per capita, according to the World Bank. Its central location has historically made it of great strategic importance to numerous powers, dating back to its founding as a Roman fortress, its hosting of a vital Frankish castle during the Early Middle Ages, and its role as a bastion for the Spanish Road between 16th and 17th centuries. Luxembourg is a founding member of the European Union, NATO, OECD, the United Nations, and Benelux, reflecting its political consensus in favour of economic, political, and military integration. The city of Luxembourg, which is the capital and largest city, is the seat of several institutions and agencies of the EU. On 18 October 2012, Luxembourg was elected to a temporary seat on the United Nations Security Council for the first time in its history. The country served on the Security Council from 1 January 2013 until 31 December 2014. Reflecting its geographic position, Luxembourgs culture is a fusion of Romanic and Germanic Europe, integrating customs of each. Accordingly, Luxembourg is a trilingual country: Luxembourgish, French and German are official languages. Although a secular state, Luxembourg is predominantly Roman Catholic. The recorded history of Luxembourg begins with the acquisition of Lucilinburhuc (today Luxembourg Castle) situated on the Bock rock by Siegfried, Count of Ardennes, in 963 through an exchange act with St. Maximins Abbey, Trier. Around this fort, a town gradually developed, which became the centre of a state of great strategic value. In the 14th and early 15th centuries, three members of the House of Luxembourg reigned as Holy Roman Emperors. In 1437, the House of Luxembourg suffered a succession crisis, precipitated by the lack of a male heir to assume the throne, which led to the territories being sold by Duchess Elisabeth to Philip the Good of Burgundy. In the following centuries, Luxembourgs fortress was steadily enlarged and strengthened by its successive occupants, the Bourbons, Habsburgs, Hohenzollerns and the French. 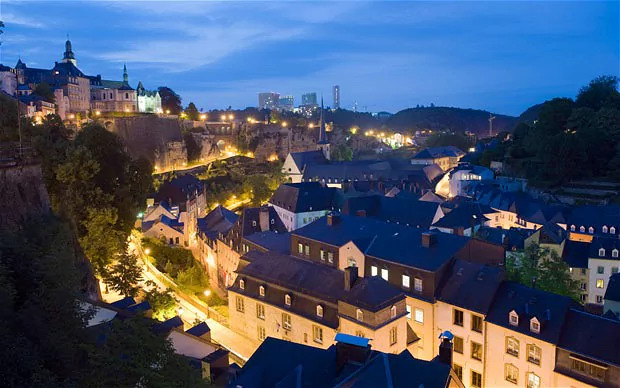 Luxembourg is one of the smallest countries in Europe, and ranked 179th in size of all the 194 independent countries of the world; the country is about 2,586 square kilometres (998 sq mi) in size, and measures 82 km (51 mi) long and 57 km (35 mi) wide. It lies between latitudes 49° and 51° N, and longitudes 5° and 7° E.
To the east, Luxembourg borders the German Bundesland of Rhineland-Palatinate and Saarland, and, to the south, it borders the French région of Lorraine. The Grand Duchy borders the Belgian Walloon Region, in particular the latters provinces of Luxembourg and Liège, part of which comprises the German-speaking Community of Belgium, to the west and to the north respectively. 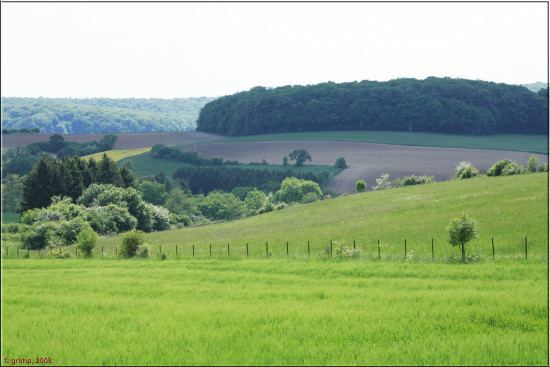 The northern third of the country is known as the Oesling, and forms part of the Ardennes. It is dominated by hills and low mountains, including the Kneiff near Wilwerdange, which is the highest point, at 560 metres (1,837 ft). Other mountains are the Buurgplaaz at 559 metres near Huldange and the Napoléonsgaard at 554 metres near Rambrouch. 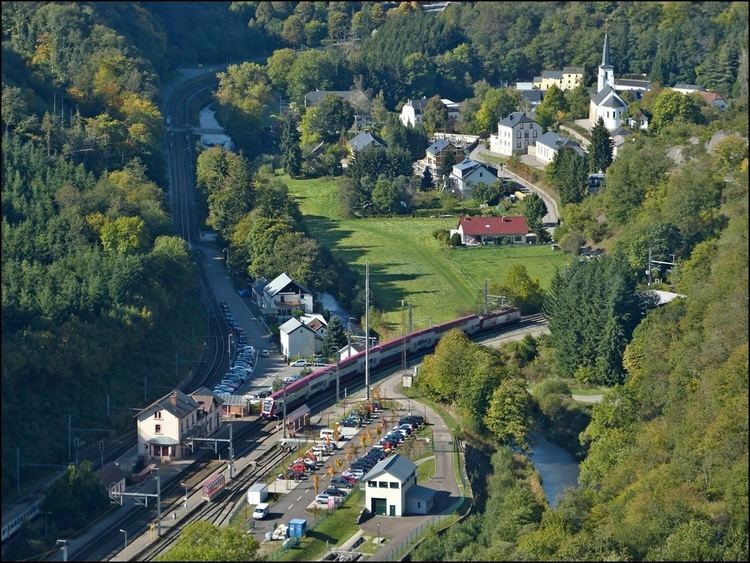 The region is sparsely populated, with only one town (Wiltz) with a population of more than four thousand people. The southern two-thirds of the country is called the "Gutland", and is more densely populated than the Oesling. It is also more diverse, and can be divided into five geographic sub-regions. The Luxembourg plateau, in south-central Luxembourg, is a large, flat, sandstone formation, and the site of the city of Luxembourg. Little Switzerland, in the east of Luxembourg, has craggy terrain and thick forests. The Moselle valley is the lowest-lying region, running along the southeastern border. The Red Lands, in the far south and southwest, are Luxembourgs industrial heartland and home to many of Luxembourgs largest towns. The border between Luxembourg and Germany is formed by three rivers: the Moselle, the Sauer, and the Our. Other major rivers are the Alzette, the Attert, the Clerve, and the Wiltz. The valleys of the mid-Sauer and Attert form the border between the Gutland and the Oesling. Luxembourgs stable and high-income market economy features moderate growth, low inflation, and a high level of innovation. Unemployment is traditionally low, although it had risen to 6.1% by May 2012, due largely to the effect of the 2008 global financial crisis. Consequently, Luxembourgs economy is forecast to have negligible growth in 2012. In 2011, according to the IMF, Luxembourg was the second richest country in the world, with a per capita GDP on a purchasing-power parity (PPP) basis of $80,119. Luxembourg is ranked 13th in the Heritage Foundations Index of Economic Freedom, 26th in the United Nations Human Development Index, and 4th in the Economist Intelligence Units quality of life index. Luxembourg has been overshadowed by the culture of its neighbours. It retains a number of folk traditions, having been for much of its history a profoundly rural country. There are several notable museums, located mostly in the capital. These include the National Museum of History and Art (MNHA), the Luxembourg City History Museum, and the new Grand Duke Jean Museum of Modern Art (Mudam). The National Museum of Military History (MNHM) in Diekirch is especially known for its representations of the Battle of the Bulge. The city of Luxembourg itself is on the UNESCO World Heritage List, on account of the historical importance of its fortifications. The country has produced some internationally knowned artists, including the painters Théo Kerg, Joseph Kutter and Michel Majerus, and photographer Edward Steichen, whose The Family of Man exhibition has been placed on UNESCOs Memory of the World register, and is now permanently housed in Clervaux. Movie star Loretta Young was of Luxembourgish descent. Luxembourg was the first city to be named European Capital of Culture twice. The first time was in 1995. 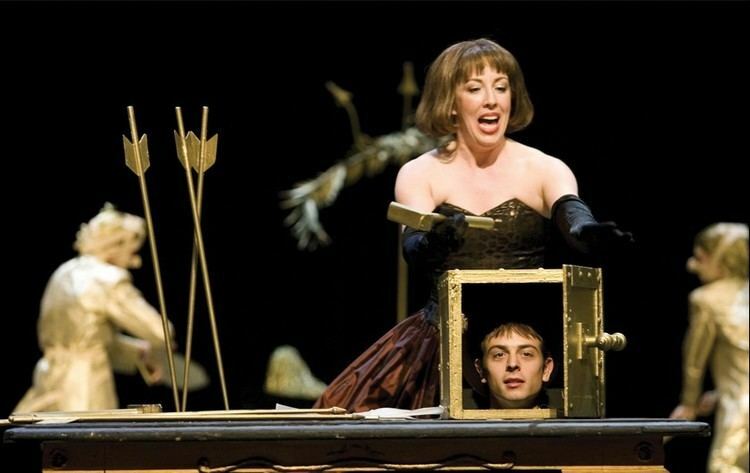 In 2007, the European Capital of Culture was to be a cross-border area consisting of the Grand Duchy of Luxembourg, the Rheinland-Pfalz and Saarland in Germany, the Walloon Region and the German-speaking part of Belgium, and the Lorraine area in France. The event was an attempt to promote mobility and the exchange of ideas, crossing borders in all areas, physical, psychological, artistic and emotional. Luxembourg was represented at the World Expo 2010 in Shanghai, China, from 1 May to 31 October 2010 with its own pavilion. The pavilion was based on the transliteration of the word Luxembourg into Chinese, "Lu Sen Bao", which means "Forest and Fortress". It represented Luxembourg as the "Green Heart in Europe". 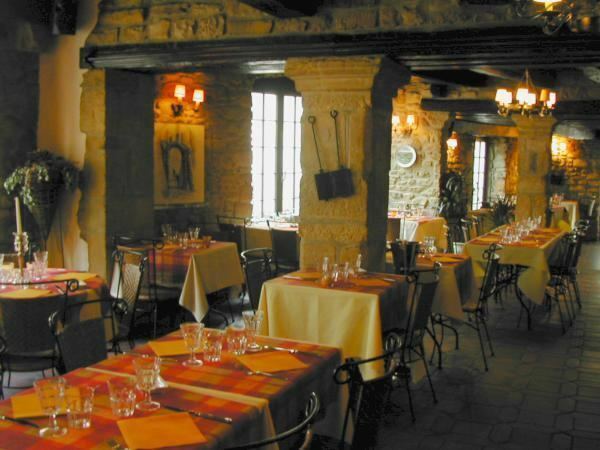 Luxembourg cuisine reflects its position on the border between the Latin and Germanic worlds, being heavily influenced by the cuisines of neighboring France and Germany. More recently, it has been enriched by its many Italian and Portuguese immigrants. Luxembourgish cuisine reflects Luxembourgs position between the Latin and Germanic countries, influenced on the cuisines of neighbouring France, Belgium and Germany. Recently, it has been influenced by the countrys many Italian and Portuguese immigrants. As in Germany, most traditional everyday Luxembourg dishes are of peasant origin, in contrast to the more sophisticated French fare. 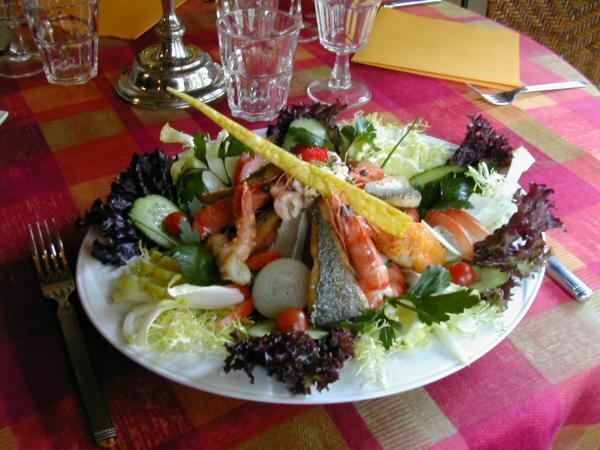 Most native Luxembourg dishes, consumed as the traditional daily fare, share roots in the countrys peasantry, as in Germany, in marked contrast to the more sophisticated French.